I was intrigued to read this piece over at the ABA Blog. One the one hand, science is awesome. On the other hand, it was hard enough for me to find one set of Evening Grosbeaks! What’s a birder to think? I guess it’s strange that I didn’t get all this hashed out in my mind when it was happening to Red Crossbills, but I’m still not sure that Crossbills are even real to begin with or if they’re a big joke everyone is playing on me. Initially, I was sad. It seemed like a Rubicon for birding in general, and citizen science in particular, if you now need specialized recording equipment to even know what you’re seeing. But that’s not the fault of the science. We already didn’t know what we were seeing, just that we didn’t know what we didn’t know. Or, we had a different way of seeing, depending on how poetic you want to get about it and how much weight you want to put on the mysterious and sometimes necessarily arbitrary nature of the species concept. It isn’t that much different, really, than the vague frustration I feel when I see a Northern Flicker with red shafts and remember that it’s technically not “different” than the yellow-shafted ones back east. There’s no reason I should be frustrated, and if I was more Zen I’d just back in the beauty of the birds (which is substantial.) But with all hobbies, and indeed all human endeavor, sometimes arbitrary rules are good just because there need to be some rules, just to increase the challenge. There’s a reason why the best free-verse poets, for instance, at least have some familiarity with formal rhyme-schemes. There’s a richness added when you understand that a bird is the first for your state, even though state lines are nothing to birds. But this is not to get into yet another digression on the hidden value (or lack thereof) of listing, chasing, and the competitive spirit. My feelings on that are notoriously mixed. 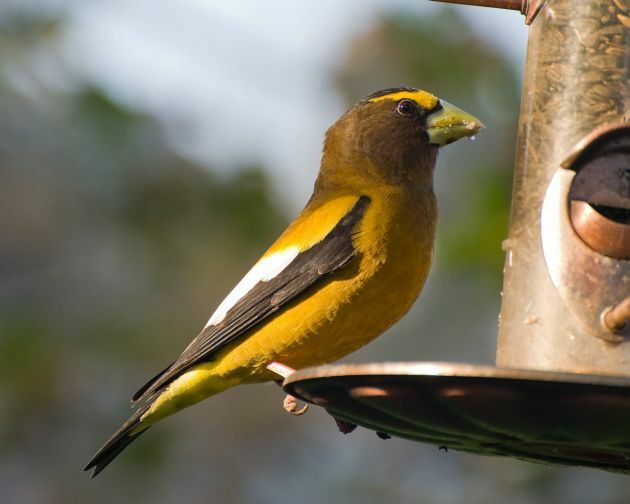 It’s mainly to make you aware that if you see any Evening Grosbeaks, whatever they may be, researcher Aaron Haiman wants to hear about them and about what they are eating. Citizen science is not dead yet.